Idiot Pilot. Where to even begin. I can't seem to get a solid opinion from multiple reviews. Some hate them, some adore them, some pages don't load. Ok, I like them, they're talented young turks with a penchant for emulation they manage to bring several styles together all at once without sounding too incoherent, though there are a few moments that make me wince a bit. (Rap?) Also, I'm not a huge fan of "Screamo" bands like Hopesfall, Underoath, Thursday and the like, but these kids mix it well. It's no secret, though it may not have come up here yet, that I'm a huge Radiohead fan, so naturally I made the Kid A connections immediately (I mean look at their original cover art) so those parts of the album appeal to me the most. In fact I had to get used to the screaming parts a while before it seemed to fit in. All in all I think they have potential and they have a great start, after all a celebrity makeover from Reprise Records doesn't just happen to every band. I'd say that they can go places if they develop more of a unique sound and don't rely so much on the blazed trails of their forefathers. I can't be too harsh on them since the damn munchkins are barely peeking out of their teens but I can give them a stern warning not to go the way of Hanson, i.e. Don't get labeled as child pop prodigies and loose your grownup cred down the road. Not that Hanson has that much grownup cred, but you get the idea. I love Idiot Pilot. such a hot duo. They're simply awesome. People should really check their music out. i love idiot pilot, awesome band :) amazing live also. but how does the duct tape get in that equation? 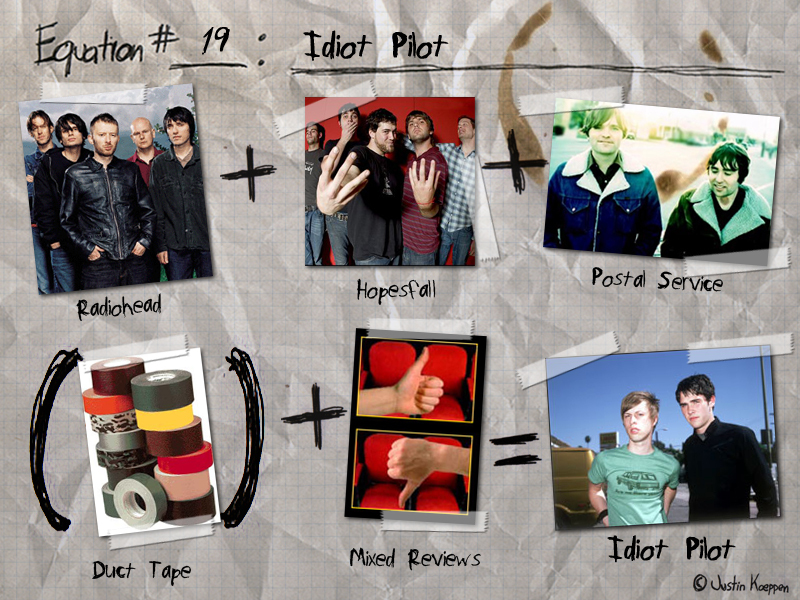 Idiot Pilot is one of the best grup of this world! !...i love those guys, there awesome!...there song are the best...i love u guys!!! they're also the two kids who steal records from Rob Gordon in the High Fidelity movie. fact.